The University of Nebraska Kearney Special Collections and Archives are housed in the Alice Paine Room on the second floor of the Calvin T. Ryan Library. The Archives Collection Development policty can be found here. 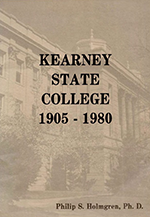 OpenSPACES@UNK is the digital repository of the University of Nebraska at Kearney. OpenSPACES@UNK supports UNK’s core values through stewardship of the University’s intellectual property. Research, scholarship, and creative works of faculty, students and staff are gathered, preserved, and shared with a global audience. OpenSPACES also makes available University publications, images, and recordings, as well as Archives and Special Collections materials. The collections reflect the quality, depth, and diversity of the intellectual activity of the UNK community. OpenSPACES@UNK is administered by the Calvin T. Ryan Library and serves as a digital home for these materials. Nebraska Scholarly Commons, provided by the University of Nebraska Consortium of Libraries (UNCL), serves all four University of Nebraska campuses--Kearney, Lincoln, Medical Center, and Omaha. The Special Collection is comprised of materials on select subject areas, such as the history of Nebraska, the Great Plains, and settlement of the West. For this Collection the Library is committed to assembling primary and secondary scholarly materials on specific topics that support UNK's curricular and research needs. All materials in the Special Collection have been catalogued and can be identified using the "Search" box on the Library's home page. Materials may only be used in the Archives. Unless the materials are deemed too fragile, the archivist will scan requested items. Photography of most items is also permitted. The University Archives are comprised of several collections of materials produced by the institution in the course of conducting its business. Materials date from as early as 1905, and include items as diverse as the deeds to the land the University occupies to the copper container used as the time capsule when the Administration Building was built. Materials are collected in all formats, including original papers and documents, publications, photographs, and audiotapes. About 1700 items have been catalogued and can be identified using the "Search" box on the Library's home page. Most of the items have not been catalogued, however, but can be identified using one of the finding aids listed below. Please note that some items have not been processed. If you cannot find what you need, please consult the University Archivist. The Blue and Gold yearbooks were published most years from 1908 through 1973, and from 1980 through 1990. Although the content varied as times changed, most volumes contain a section about faculty and staff, student photos by class, student organizations and life, as well as campus events and sports. Together, the Blue and Gold Yearbooks are an irreplaceable photographic chronicle of the institution through most of its history. About 40 print volumes are held in the Book Collection and can be checked out. For access to the print volumes held in the Archives, please consult a librarian. PDF files of all the yearbooks produced are available below. Antelope issues from 2016 & 2017 can be found on OpenSpaces@UNK. More recent issues are available on the Antelope website. By Philip S. Holmgren, Ph.D.
As with items in Special Collections, materials may only be used in the Archives. Unless the materials are deemed too fragile, the archivist will scan requested items. Photography of most items is also permitted.